It’s Fall now and I’m all about the baking nowadays. Bring on the breads, cookies, and cakes! I’ve always been a better baker, I think, than cook. While I enjoy both, I think baking lends more creativity, don’t you think? I’m not a decorator though! Those elaborate wedding and birthday cakes have never been my forte. Fall is the perfect hiking season here in Colorado. The weather is cool, the aspens are turning brilliant colors, but there’s not a ton of snow yet. Give it a month, and you’ll be traipsing through 3 feet of snow in those higher elevation mountains! These trail mix cookies are a perfect snack to take along with you while exploring a fun, new trail! Or do like we did and bring them to the zoo! 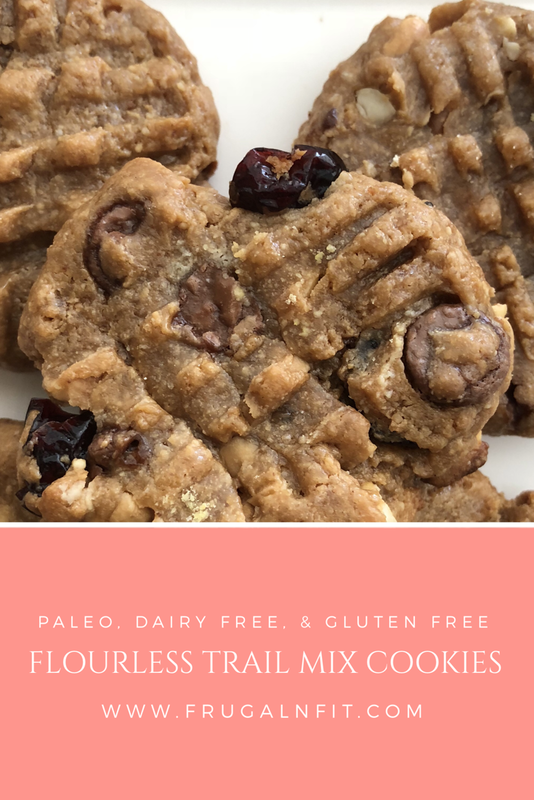 These flourless trail mix cookies hold up well so take them anywhere on the go! Camping, hiking, road trips; they’re super easy to put together and will last three or four days in an airtight container. These flourless trail mix cookies are a spin off of my 5-ingredient cookies. They’re just nut butter (this time I used unsweetened peanut butter because that’s what I had on hand. But switch it out for almond or cashew butter if you’d like to stay Paleo with these or if peanuts aren’t your thing), egg, coconut sugar, vanilla extract, and chocolate chips. That’s the original recipe. This one adds collagen peptides (helps with binding and gives a better texture), chopped nuts, and dried unsweetened cranberries. You could also use raisins if you’d prefer. I’ve really been liking the addition of collagen to my cookies. It’s helped give an extra healthy boost by adding it and I really do think it helps with texture. It is kind of pricey though so feel free to leave it out if you’d like. My original cookies didn’t use it and I think they came out fine! I used Orgain’s Organic Collagen Peptides in this recipe if you’d like to try it. It’s flavorless and great for hair, skin, bones, and nail strength. It also helps promote a healthy immune system (important as we head into winter!) and is great for gut health! If you suffer from gut issues like me, I definitely recommend you read this article by Vital Proteins. Collagen has been so beneficial in helping me right some of the health issues I’ve been dealing with! Add nut butter, vanilla, collagen, and coconut sugar to egg. Stir to combine. Fold in chocolate chips, cranberries, and nuts. Bake 8-10 minutes or until set and cookies are lightly brown. Remove from cookie sheet and cool completely. Enjoy! My husband and I are trying to get all the hiking in that we can before the snow comes (although we were hiking near winter park last weekend and would’ve benefited from snowshoes). These cookies look like the perfect hiking or skiing snack! My brother was just telling me that his hike near Winter Park was quite snowy! ‘‘Tis the season in Colorado!